The Mysteries of the Rosary offer intense events within the lives of Jesus and Mary for focus and contemplation while we recite the prayers of each decade of the Rosary. 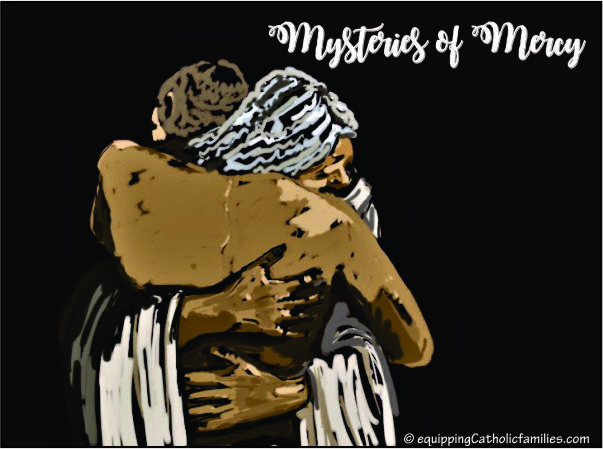 While the Chaplet of Divine Mercy is considerably shorter, I started wishing there were associated Mysteries of Mercy to contemplate during each decade of prayers. In Scripture, we see Jesus model His Mercy as He interacts with the people and preaches to them. I did search online for Mysteries of Mercy, but only after I tried my best to extrapolate them for myself from Jesus’ Public Ministry. The Chaplet of Divine Mercy impresses upon us that we can ask for His Mercy in atonement for our sins and those of the whole world. His Mercy targets every facet of each one of us: our souls, our sins, our weaknesses, our struggles, our health, our insecurity, our doubts and our fears. His Mercy heals our bodies and souls. His Mercy can RESTORE each one of us to the person He created us to be. We just need to be willing to ask for it and to be open to receivingHis Forgiveness and Healing. The Parable of the Prodigal Son is perhaps the most straightforward and comprehensive example of God’s Mercy. The son squanders his inheritance and is reduced to shame and poverty, but is welcomed with open arms by his father who restores his dignity. He has forfeited everything: his soul, his wealth, his social standing, his dignity and he believes even his father’s love and yet the father restores everything to him in response to his brave and humble return. Jesus reached out to publicly known sinners from tax collectors to prostitutes; He publicly absolved the woman caught in adultery and sometimes He absolved people before He healed them. He knows our shame but He loves us unconditionally, inviting us to repent, start again and follow Him. He lives to love us, not condemn us. Even in the midst of His own Suffering on the cross, He forgave His Accusers (for they know not what they do) and He assured the Good Thief that he would be welcomed into His Kingdom. His Mercy washes over our sin, absolving us. He restores our SOUL. Jesus fed the 5000. He recognizes and fills our physical needs. 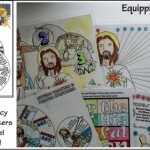 Jesus likely healed many more people than are even recorded in Scripture. He healed them from possession of evil spirits and probably every kind of physical ailment including blindness, hemorrhaging, leprosy, paralysis and even death. Jesus extended His Healing Mercy to them in response to a desperate plea or even a small act of Faith. Jesus readily recognizes our insecurities and doubts. He sought out Zaccheus who had climbed a tree to get a glimpse of Jesus as he walked by. Zaccheus was short and was unable to see Jesus through the building crowd. Perhaps he was also insecure in some other way and didn’t feel worthy of the crowd. When Peter began to doubt as he walked on the water towards Jesus, Jesus reminded Peter to keep his eyes on Him. That sounds like a good reminder for all of us. Tossed about in a boat on the troubled waters or faced with the uncertainty of the future arrest and death of their Savior, Jesus is well aware of the fears that cripple us. With unending Mercy, He instructs us to “Be not afraid”. If we can keep our eyes focused on Him and trust in Him, He assures us that ultimately we will be ok: He can use all things for good and He wants us to join Him in Eternal Life. His Mercy calms our fears. He restores our Faith and Hope and Peace. 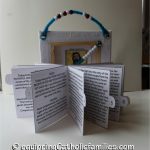 NEW Craft Kit for Divine Mercy! 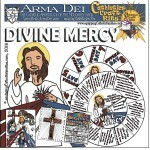 NEW Divine Mercy Abacus with Novena Prayer Carousel!